I was under the false assumption that this was a straight up dystopian novel. And that does a disservice to this story. Incarnate brings us into a wonderfully realized world of fantasy. We are introduced to Ana as she sets off for Heart, the city where all of her people live. She wants to find out why she is here and where she comes from. She's been secluded her whole with her mother, Li, because she is embarassed that Ana is new and doesn't feel like she belongs here. Li is so horrible to Ana, mostly because Ana replaced her friend, who was supposed to be reincarnated. Of course it doesn't take long for her to run into trouble. She runs into a Sylph, these shadowy monsters that burn you to death. One attacks Ana and nearly kills her, but after she manages to out run it and jumps into the freezing lake, she is saved by Sam. She's never been able to trust another, because Li always lied and abused her, so he has a hard time accepting Sam's help at first. Eventually she does and the two of them head back to Heart, only to be met with more troubles. The story had such an intriguing premise and I was so curious to learn more about the mysteries of Herat, and how the people there were able to be. Unfortunately, it was really slow going for about the first half of the book. We spent a lot of time reading about day to day activities and there wasn't a lot of action happening in the book. We learn quite a bit about Heart and the people who inhabit it, but nothing very exciting really happens until quite a ways in. That's not necessarily a bad thing, because the things we found out were interesting and provided a nice picture of who all of these people might be, but sometimes it dragged for me and I was anxious for something to happen. Of course, once things started happening, they didn't let up. My favorite thing about this book, were the dragons. I was not expecting them and I am so glad they appeared. It gave the world just a little more depth and brought out the fantasy elements even more. We get some shocking twists, secrets revealed, and even more mysteries for the next book to flesh out. 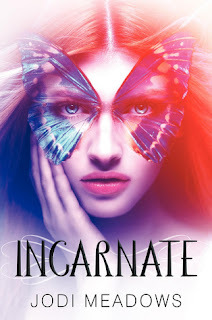 I love the idea of reincarnation and what Jodi Meadows has done with it here. Now let's talk a little about Ana and Sam. There is definitely a great romance in there, but it's not the stuff of fairy tales. There is no instant love connection, or the creepy dependency going on here. The romance is slow and tentative, it builds throughout the story and feels very authentic. By the end of the book you really believe that they have these feelings for one another, it doesn't seem false or forced, because of their situation. I really enjoyed the two of them as the main characters, too. They are very much their own people, but they also have so much in common. Ana started out distrustful and strong willed, and by the end of the book she is still strong willed, but has learned that she can count on others. Sam is an old soul, literally, and because of this he could have been completely patronizing and unwilling to believe Ana could do anything for herself. At first he had moments where he treated her as new, but for the most part he was encouraging and wanted her to learn. The two of them together made for some very enjoyable reading. thanks so much for this awesome review! I am very xcited for this book! I've heard so many good things about this book - can't wait! Great review! I definitely agree with you about the romance - slow connection building is the best! I'm really looking forward to what she does with the next book. This book sounds so poignant and good. Thanks for the review. I read the first 40 pages and stopped, but now I will give it another shot.